COUCHED IN CREATIVITY. Alak Phillips is one of the co-founders of Ivy Creatives, a new downtown Eau Claire co-working space. Eau Claire is growing into becoming one of the cultural centers of the region, but collaboration is key to the area’s success, two new business owners say. 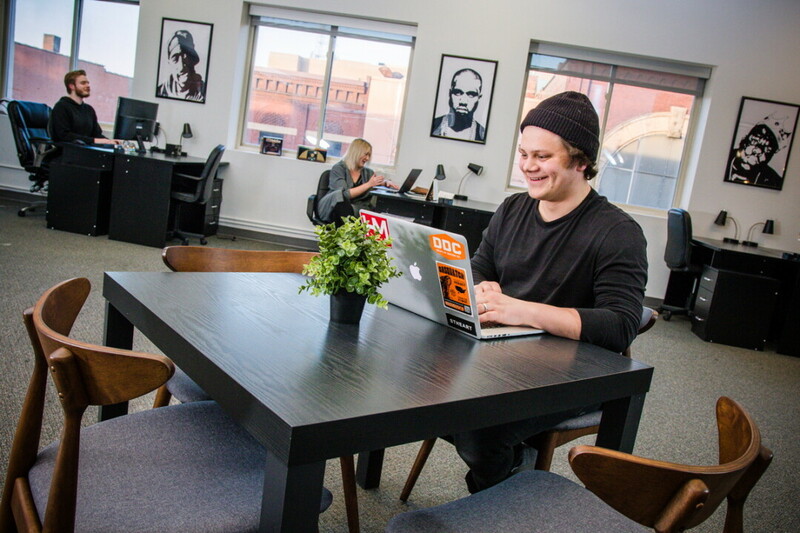 Alak Phillips and Kyle Lehman are the co-founders of Ivy Creatives, a new co-working space situated on Barstow Street in downtown Eau Claire. The venue features studio spaces equipped for photo shoots, podcasting, and recording as well as a wide array of equipment and technology to help users accomplish their creative pursuits. Sprinkled around the Ivy space are numerous couches, desks, and spaces for artists to work in addition to a station for creatives to rehydrate on espresso and lattés. The studio is a subscription-based service. Individuals and teams can rent a spot in the shared space, a private desk, or a studio space on a monthly basis. These memberships range in price from $75 on up depending on the needs of the artist. Phillips said he wants the space to be able to accommodate any creative need and be a catalyst for collaboration and innovation. The inspiration to open Ivy Creatives came from a mutual desire between Phillips and Lehman to further the creative culture in the Chippewa Valley. Lehman wanted to have a space photographers could work year round in. Phillips wanted a space for creatives to collaborate among multiple mediums. From there the two decided to band together to make the space a reality. During the roughly six months between the decision to make the space a reality and the opening event a few weeks ago, a lot of hard work and dedication went into making Ivy Creatives happen. Lehman worked tirelessly as a freelance photographer, saving as much money as he could, and Phillips even went as far as selling his motorcycle to collect the necessary capital to make Ivy Creatives viable and sustainable. Lehman said the space is essential for some creatives, as sometimes it is hard to remain focused on art when you’re not in a space that is devoted to furthering that art. Phillips said he has firsthand experience collaborating in the space already and it can be beneficial for certain creatives who don’t have others around to throw ideas towards. Currently Ivy Creatives has 10 members, including Kyle Culver, who runs a recording studio dubbed Sprinter Studios out of the space, and Matt Hasenmueller who records his podcast Matt’s House, in one of Ivy’s dedicated recording spaces. Lehman added that Eau Claire is a great area for a space like this, as it might entice some graduates from UW-Eau Claire to stay in the area and help Eau Claire live up to its evolving reputation as one of the cultural cornerstones of the Midwest. 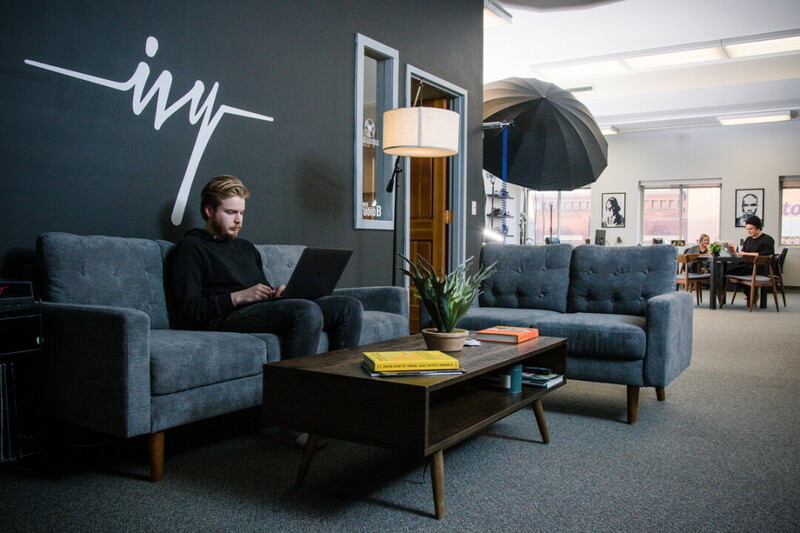 Now that Ivy Creatives is open and operational, Phillips and Lehman hope the studio can come into its own and become a “well-oiled machine,” to the point where they can start to expand to other areas of the state including Madison, Green Bay, and Appleton. But wherever Ivy Creatives takes them and their members, their success will rest on a base of passion and collaboration. For more information on Ivy Creatives and their offered services, you can visit their Facebook page at facebook.com/ivycreatives.